As I sit on the Irish Ferries ship sailing home to Dublin from Holyhead bobbing about in the Irish Sea like a rubber duck crammed in with a couple of thousand people or so I reflect on this past weekend. Late Thursday afternoon I proposed to Joanne something that seemed utterly ludicrous, “ How about this weekend… hear me out… Lets drive to Wales”, that did of course involve a ship for 3 hours but still let’s drive over! For years I have wanted to do this, getting the ship over to the UK seemed like a cool challenge to me. Ok I know what you are thinking it is not particularly challenging Will, thousands of people do it daily. I reckon it is because I know my parents would have never done it, I want to complete and achieve stupid stuff like this. After much fevered debate over WhatsApp and roping Joanne’s mum in to go with us we booked the ferry over to Holyhead departing 8.05am Saturday morning. We also booked our first AirB&B experience staying at the Pantasaph B&B. My other reason behind doing such a trip was to get my head around getting the ferry over and driving to the UK for next Summer. The current existing plan for June 2019 is… it will change as I am a complete disaster keeping plans actually planned with out diverting, but I digress we are going to go Cornwall next year. I needed to know how it all worked and wanted to see if there were any tips I could learn. At the crack of dawn Saturday morning we collected Joanne’s mum and before we knew it we had boarded the ship in Dublin port. I thought well that was ridiculously easy, nothing to it. We took our sea sickness tablets an hour in advance of boarding so that helped, I have never really done well with ships or boats before so these helped alot. The ship itself was chock full of all kinds of people, mostly older people , truckers and tourists heading back to the UK. Our immediate thought was how chilled it was to be cruising across the Irish Sea being able to go wherever we wanted in the ship, they even had an onboard duty free-ish. The journey took 3 hours in total arriving in to Holyhead at 11am. The weather was quite miserable getting off the ship and that pretty much lasted until the mid afternoon. We drove from Holyhead to Chester in England firstly, I picked it as an arbitrary destination that was not too crazy like going to Liverpool or Manchester. I had been to Chester before as a child when our parents took us to Pontins in Prestatyn for a week. We were taken there 29 years ago for a day out so I didn’t remember all that much about it. 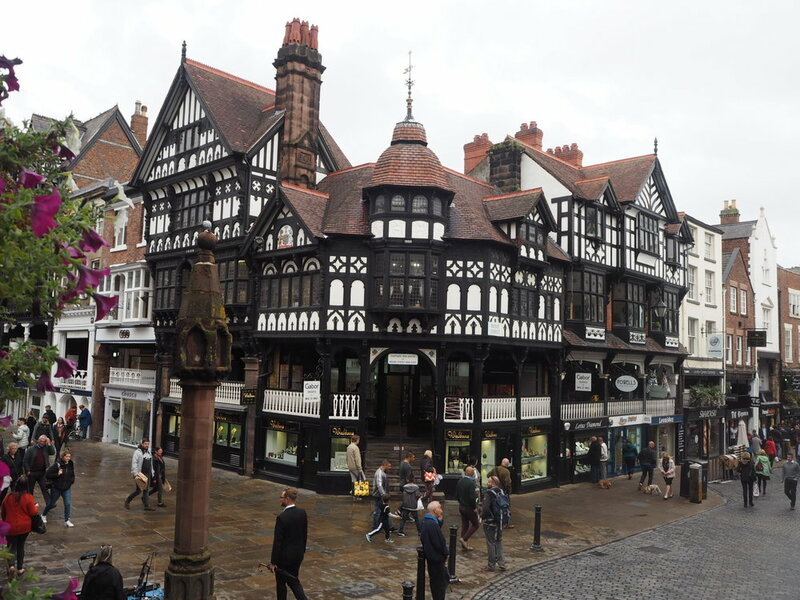 The Chester we arrived at in the pouring rain was a beautiful city with the most architecturally pleasing Tudor buildings. 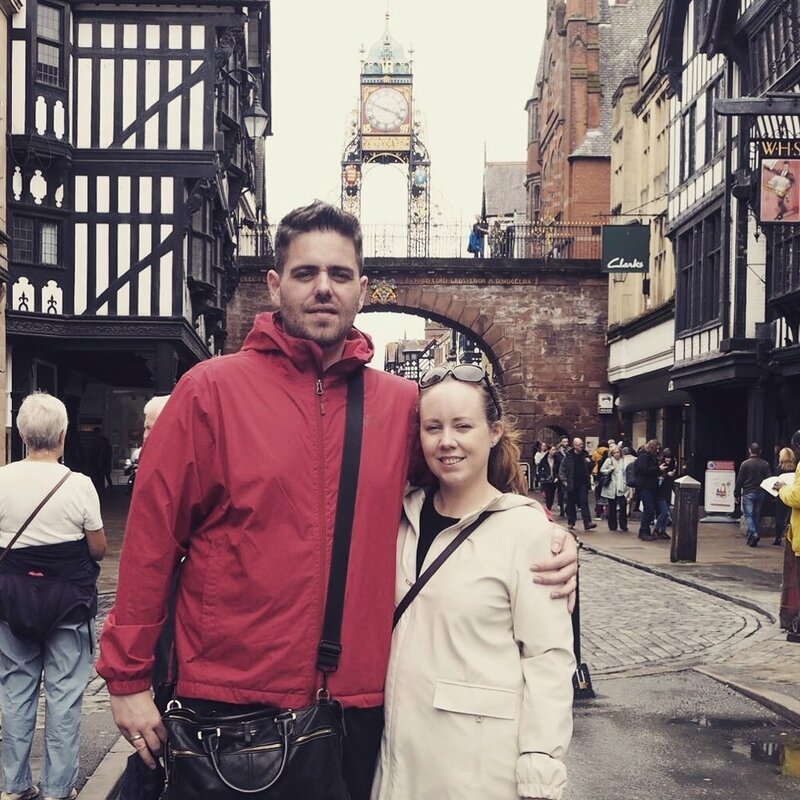 We wandered around Chester checking out some shops and taking pictures despite the abysmal weather. Shortly after we arrived however I received a text message from Irish Ferries saying our return ferry was cancelled and we had to get the earlier sailing on Sunday at 2.10pm. This really scuppered my plans, so right there that is a lesson learned for next year, do not book the Swift sailing as it is very much at the behest of the weather conditions, stick with the Ulysses ship. As a result of this we decided to go to Cheshire Oaks Outlets right after Chester so we could check out their bargains if they had any. Cheshire Oaks is like Kildare Outlet Village on crack, with better bargains in my opinion. I managed to pick up 4 pairs of shoes, the English seem to like big sized shoes for us big footed folk so I was chuffed. We got a quick bite to eat in Wagamamas, keeping it healthy because I am on a clean eating plan at the moment. All in all it was a great day , it was hard to believe we had only driven over earlier that morning. Straight after breakfast we rushed off to try and maximise our day before heading home to Dublin. We decided to check out Caernarfon and its castle. When we got there we found out the castle was free for the day which made the visit all the better. Caernarfon Castle is fantastic and a world heritage site. What we only found out yesterday was that Prince Charles was actually officially made a Prince here which I found interesting, I have been watching way too much of The Crown. Before we left Caernarfon we stopped in to Morrisons, what I found so intriguing was there was so many people speaking Welsh, it was really nice to hear, it is such a different language and it is great to see the Welsh take such pride in their own language. The Welsh and Wales are lovely people, we are definitely going to add it to our list of places to visit next year on the way to Cornwall. British Roads make for great driving. Be careful with the ship sailing times and book the large ship as opposed to the Swift ship. We cannot wait for next year and our trip to Cornwall, I have been planning this for weeks now already and we are even more excited about it.